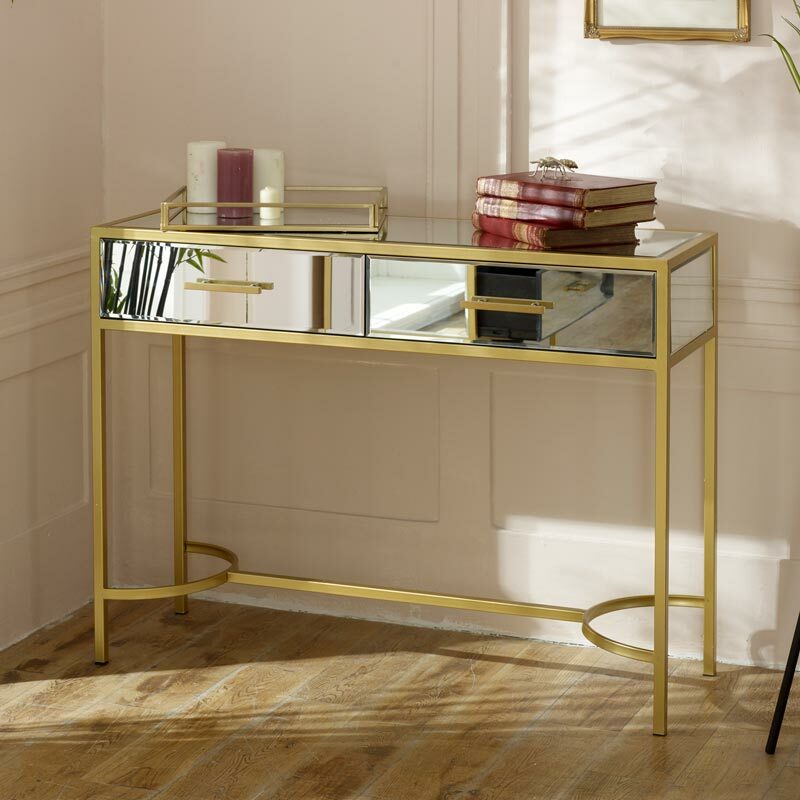 Large mirrored console table with gold painted metal frame. Stunning luxe look living room and hallway furniture, perfect for the modern, contemporary and vintage styled home interior. The Venus Range comes with matching furniture pieces. 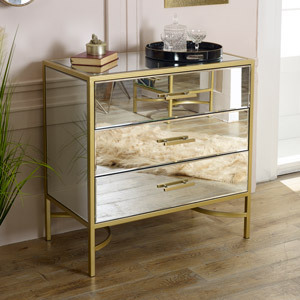 This gorgeous table comes fully assembled with clear glass mirrored top and gold painted surrounding metal frame with curved leg supports. Wonderful glam, luxurious furniture that will suit many homes. Offering great storage with 2 drawers on metal runners. This console is ideal for placing in the living room or hallway for displaying ornaments or flower arrangements. 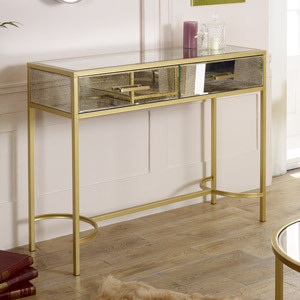 Large mirrored console table with gold painted metal frame. Stunning luxe look living room and hallway furniture, perfect for the modern, contemporary and vintage styled home interior. The Venus Range comes with matching furniture pieces. This gorgeous table comes fully assembled with clear glass mirrored top and gold painted surrounding metal frame with curved leg supports. Wonderful glam, luxurious furniture that will suit many homes. Offering great storage with 2 drawers on metal runners. This console is ideal for placing in the living room or hallway for displaying ornaments or flower arrangements. 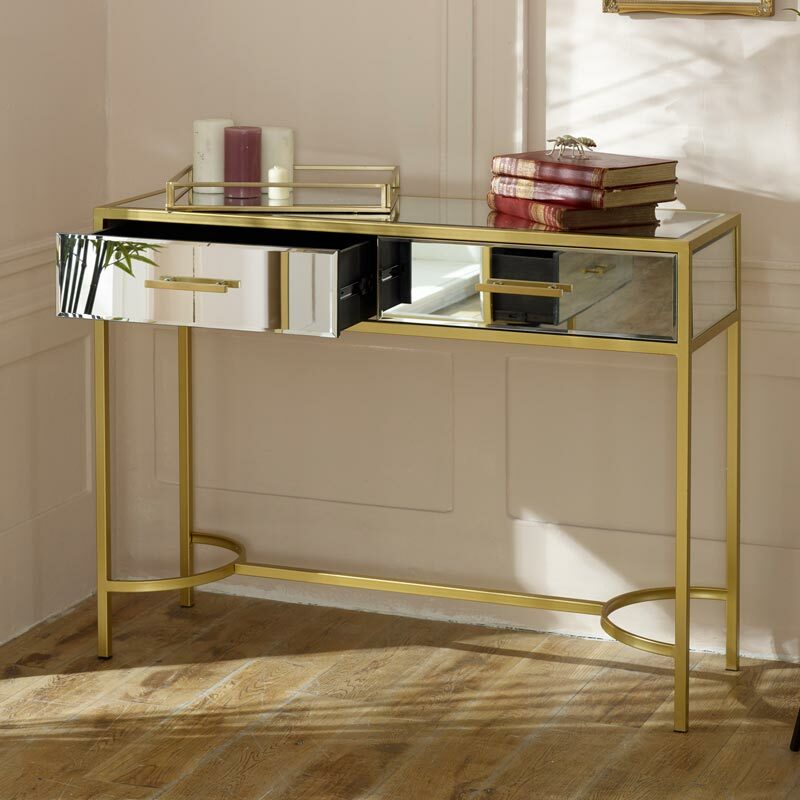 Constructed with a mirrored tabletop in a gold painted metal framework. The table comes fully assembled and ready for use. We have a simply marvellous collection of console tables in a variety of sizes, colours and finishes for that truly exquisite and stylish look. We have a small selection of furniture in the Venus Range, includes chest of drawers and side table.